Supplier of pipe couplings to the mining, water, construction, civil and shipbuilding/Offshore Industries. Distributing to Australia, New Zealand and the Pacific Islands. Welcome to KCES’ new website! KCES is based in Melbourne, Australia, and we specialise in pipe couplings, the flexible mechanical pipe joints used around the world in applications as diverse as water and wastewater, mining, construction, industry and shipbuilding. Being lightweight, compact and quick and easy to install, they can improve productivity and enhance OHS, and have many other advantages over traditional pipe joining techniques in both constructing and modifying pipelines. KCES is a small family-owned business and we care about you and your business. We sell only the highest quality European manufactured pipe couplings and repair clamps to give you, your customers and clients peace of mind, and deal only with suppliers who share KCES’ outstanding customer service values. For your convenience, we stock a wide range of products at various locations across Australia and New Zealand to enable prompt delivery (we aim for same day despatch if we can manage it). With over two decades of experience with pipe couplings and their applications in Europe, the US, Asia, Australia and NZ, on-the-spot product advice is just part of our unsurpassed expertise and service. We can also provide training at your premises by arrangement. Speak to KCES, The Pipe Couplings People, Engineering Solutions since 2004, and find out how easy we can make your pipe-related life. Thank you to everyone who visited us at Ozwater in May. We appreciated your time very much. 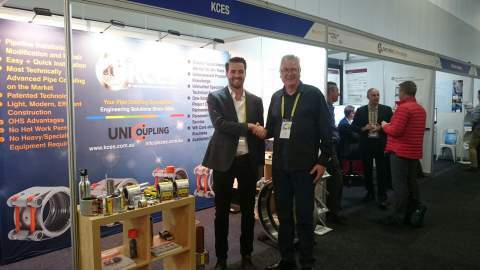 Also many thanks to Hein who came from UNI-Couplings (part of the United Pipeline Products Group) in The Netherlands to support us in the launch of their fantastic new product range in Australia. Highly technically advanced and with a superior build quality, UNI-Couplings are manufactured entirely on the premises of UPP, enabling a quick turnaround and immediate quality control. Like KCES, UPP is also a family-owned company emphasising quality of both product and service. Supplying pipe connection and repair products since 1988, it is now a global player. Hein is the next generation of the family; UNI-Couplings are the next generation of pipe couplings. KCES is very proud to offer this range on the Australian market. 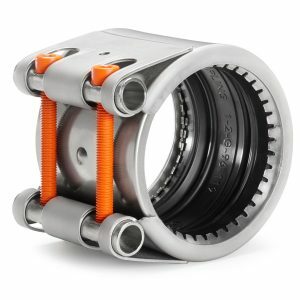 For further information about UNI-Couplings, please see the product information on this site, or send us an email to info@kces.com.au for a brief product overview or the more detailed technical manual, or call +61 3 9728 3973 for a No Obligation chat.